Vong came to the United States of America on Monday, November 15, 1976. His family immigrated here as refugees from Laos, after the kingdom of Laos fell to communist rule. Many Hmong fought alongside America during the Vietnam War; however, their battles were fought in neighboring Laos in a “Secret War,” that few knew about. Over one third of the Hmong people died in that war while rescuing downed American pilots, stopping the Ho Chi Minh trail, and conducting special ops missions. Laos fell, and with it, so did freedom for an entire nation. Thus, the Hmong had to leave a homeland that no longer welcomed them. Vong moved to Clovis from Huntington Beach in 1996. He studied at UCLA and went on to obtain his Juris Doctorate degree from San Joaquin College of Law. He currently works as the Solar Director for Fresno EOC, helping to ensure that low-income families receive solar on their homes. He also teaches at Fresno State. On Sundays, he loves teaching the children at his church. Passionate about service, Vong has and continues to serve in many capacities on various organizations within the community. Most notably, he spent over ten years on the Clovis Planning Commission – the last four as Chair. 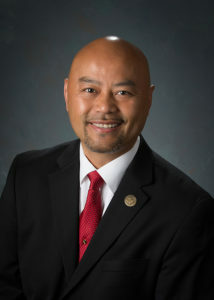 With encouragement from his wife Jane, his five children, and his family, Vong is humbled and honored to serve the Clovis community as their Councilmember. His father was right… Clovis is the shining example of worthwhile lives living together in America. Its residents are people who work hard, who live honestly, who love serving their fellow neighbors, and who fear God. Coincidentally, this is nothing short of what many call “The Clovis Way of Life,” and it is contagious. Grateful for this amazing City, Vong will work hard to make sure everyone is welcomed in Clovis and that our “Way of Life” continues for you, your children, grandchildren and many many generations thereafter. Councilmember Mouanoutoua may be contacted via email or by phone at the number below.